In connection with Medvedev’s election as the President of the Russian Federation (RF), many speculations concerning the possible change of Russian foreign political course appeared. These surmises were partly confirmed, partly rebutted and partly let untouched by Dmitry Medvedev’s first foreign visits. Notwithstanding the opinion of some Belarusian analysts that the first visit of President Medvedev will lead to Belarus (1), Kazakhstan was the first country to be visited by Medvedev after he had been elected President. His further visits led to China and Germany, whereas the selection of these states as well as the course of official visits was open to various foreign political interpretations. The visit to Germany turned out to be a disappointment for those who had awaited a fundamental change of Russian foreign political vectors. According to the editor in chief of the magazine Russia in Global Policy Fiodor Luianov Medvedev has been following the course set by Vladimir Putin not only in the narrow sense (stances on further NATO enlargement, US anti-missile shield (AMS) and the question of the status of Kosovo and Metohija), but also in relation to the establishment of the RF as a subject of international relations during last two decades (2). According to the Director of Russian Deutsche Welle online and radio editorial team Ingo Mannteufel a friendly atmosphere, which was in Medvedev’s as well as Angela Merkel’s interest, was perceptible during the visit to Germany. The criticism of the West as for the fields mentioned above was mild in comparison with Putin’s appearances at the end of his term of office. This reinforced the prospects of the positive development of bilateral relations which is predominantly in the interest of German entrepreneurial elites (3). Ideological principles mentioned in the Russian President’s speech confirm to some extent the opinion of analyst Pavel Usov (4) that the ideological concepts of Eurasiatism and Neo-Eurasiatism aren’t just empty words but they acquire concrete political forms. Eurasiatism, as a concept based on the vision of Russia as a unique room uniting Asia and the West, is at the same time programmatically different from Atlantism, which emerges from the ideological sources of Westernism in Russian environment. According to his own words Medvedev is convinced that Atlantism, as the only principle, is historically exhausted and that it is the ideas of the unity of the entire Euroatlantic room from Vancouver to Vladivostok which are topical nowadays (5). In the environment of Russian political elites, the idea of Russia being the unificator of civilisations is a breeding ground for the interpretation of the restoration of RF’s status within international relations. In the mentioned Medvedev’s speech, the knowledge of the inconsistency of RF’s strategic interest with further enlargement of the Alliance put NATO in a position of an out-of-date institution. The absence of handling the task of the Alliance as a means of US struggle for world hegemony is perceived to be a mitigation of the Russian representative’s rhetoric from the position of Western observer. This is confirmed also by Medvedev’s statement that NATO cannot find the meaning of its existence under the new circumstances. Not even the globalisation of the Alliance’s mission including the enfeeblement of the primary status of the UN and possible enlargement can change this situation (6). From the point of view of perception, these words bring two positive effects: They are understood rather positively by the West owing to the absence of aggressive rhetoric, however, for Russia they represent a signal which confirms the historical exhaustion of Westernism and the vision of Russia as an empire uniting conflicting civilisation rooms. Nevertheless, in connection with Russian foreign policy, Medvedev’s visit to Germany hasn’t confirmed the conduction of the concept of a “geopolitical hedgehog”, which was expected from the new President by the Head of southern coordination centre of the International Eurasian Movement Alexander Proselkov (7). Towards the inside of the state the anticipated concept encompasses a socially orientated policy through the development and implementation of Russian Federation’s National Projects (hedgehog’s abdomen), towards the outside it includes sharp reactions to plans concerning the US AMO system extension, NATO enlargement and the recognition of unilaterally declared independence of Kosovo and Metohija. According to Proselkov “hedgehog’s spines” stand for Russian politicians like Dmitry Rogozin and Alexander Dugin (8). From the point of view of the reception of Medvedev’s person, however, it’s interesting that Dugin himself perceives Putin a genuine nationalist with the mask of a liberal and Medvedev a liberal with the mask of a nationalist (9). After the period of Yeltsin’s liberalism leading apart from other thing also to an unprecedented decline, the loss of a dignified international status and the minimisation of the people’s national confidence, Russian state is marked by the renaissance of national as well as conservative ideology. However, this cannot be understood as a system feature of Russian policy. It’s rather a means of the realisation of national and state interests of the RF and its power elites. The integrating moment of Russian post-Yeltsin politics represents rather the reinforcement of state’s role in diverse spheres of the society. In this connection the interests of the state and power elites are probably superior to the supposed liberal orientation (from the viewpoint of Medvedev’s politic psychology). Simultaneously, it’s not insignificant that Medvedev, who (in spite of suggestive news brought by the western media) isn’t a rookie in Russian politics at all, has (10), has proved himself fully loyal to higher power interests so far (11). In the case of possible NATO eastern enlargement, these interests are manifested by an unequivocal disapproval of this possibility. In accordance with the idea of an exceptional status of Russia in Eurasian room Medvedev speaks of an illusion and not a real possibility. Thus he mitigates concurrently the former President Putin’s confrontation rhetoric confining himself to the warning of a major damage to the relations between the RF and NATO. Instead of accepting this neuralgic point, Medvedev highlights mutual cooperation in relation to Afghanistan which is manifested besides other things also by the agreement on overland transport of non-military cargoes into Afghanistan as well as the extension of Russian participation in the preparation of experts working in anti-narcotic and anti-terrorist centres (12). The fact that Medvedev’s first two visits were directed at the East needn’t be overrated from the viewpoint of Russian foreign political orientation. 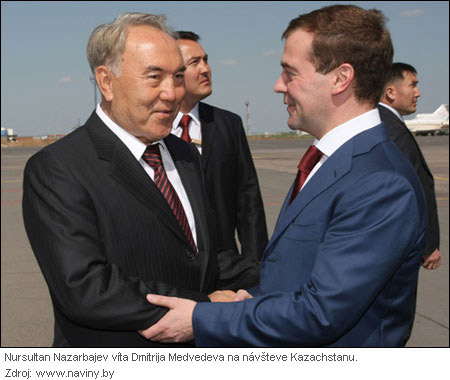 In Astana, Medvedev and Nazarbayev concluded an agreement on the creation of a collaboration plan in the period 2009 – 2011, which was a standard step in terms of the development of bilateral relations between the RF and Kazakhstan. Nevertheless, according to the Russian daily Utro the conclusion of agreements in the field of power engineering (the agreement on the construction of a Caspian gas pipeline, the capacity increase of the oil pipeline Central Asia – Centre and the establishment of a joint venture in the area of nuclear power engineering with the purpose of building a nuclear power plant in Kazakhstan) stands for a kind of foreign political signal towards the West (13). The visit to Astana was under way during the Energy Summit at which the representatives of pro-western post-Soviet countries negotiated about the possibilities of constructing pipe routes bypassing the territory of Russia and signed the declaration on the establishment of a joint transport room. It’s a well know fact that Azerbaijan itself hasn’t enough energy bearers for the filling up of projected pipelines, whereas the capacity increase of the oil pipeline Central Asia – Centre reduces chances for the conduction of these projects. The daily Utro interprets this Kazakhstan’s forthcoming step towards Russia (which is furthermore linked with the reanimation of the idea of the establishment of a Single Economic Area the feasibility of which cannot be disputed legitimately for the foreseeable future) as a concession in exchange for future Russian support of the construction of water transit corridor between the Caspian Sea and the Black Sea. Medvedev dealt particularly with economic questions also during his official visit to Beijing, whereas the conclusion of agreements on uranium enrichment and the export and import of aviation technology represents a continuum as for the existing cooperation between the RF and China (let’s mention, for instance, the termination of the building of Tian-Van nuclear power plant). The daily Utro underscores that a whole range of questions remain open as regards the collaboration of these countries, for example, the participation of Rosatom in the construction of twenty energy blocs (14). It’s natural that the choice of states for the first two official visits of the Russian President sparks reactions. The fact that the cooperation with the West isn’t necessary for Russia from the economic point of view since Central Asia stands for a sufficient future alternative to the cooperation between Europe and the US is interpreted as a signal towards the West in terms of these reactions. The course of first three visits, however, isn’t a sufficient qualification for facing an abrupt change of Russian foreign political orientation towards a confrontation policy on the West.